The Heart of a Woman – loudlatinlaughing – Euge! Euge! 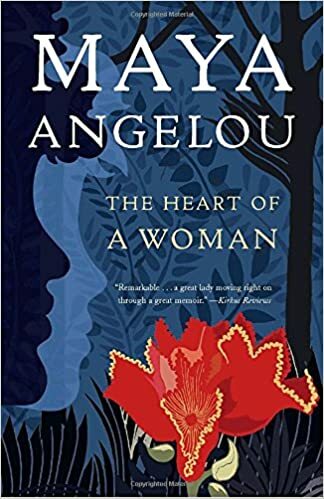 I love reading Maya Angelou and enjoyed this memoir detailing her history in the late 1950s and early 1960s, shuttling from a houseboat commune in Sausalito to LA to NYC to Cairo and beyond. Her work in NYC brought her in contact with Martin Luther King, Jr., Malcolm X, James Baldwin, Max Roach, among others. Most interesting to me were the descriptions of life in the ever-changing times, her mother and her being the first black hotel guests at a Fresno hotel that had just opened to blacks, her description of the streets of Harlem teeming with people to see speakers, her memories of life in the Fillmore district with a car accident at Fulton/Gough and her son learning to ride his bike in Alamo Square (“a park on Fulton”, I assume is A-Square). Unfortunately, she marries an African freedom fighter mid-way through and gives up her work outside the home, retreating even from friends. She makes us suffer through the long, tedious marriage that you know is going to end, but not until they get to Cairo and she has further proof of his infidelity in addition to unpaid bills that he ignores. He also becomes enraged when she gets a job. Good riddance, she jettisons him near then end, then wraps up the tale with further travels in Africa with her son. Still, a strong first half and fairly weak second.